Lone Wolf Ceramic Hummingbird Feeder, Ladybug, 10 oz. Feed the hovering hummingbirds in your yard with the Lone Wolf Ladybug Ceramic Hummingbird Feeder. Featuring three ports on this beautiful, signed and dated feeder, hummingbirds will be attracted to the bright red ladybugs surrounding each port. For best results, hang this feeder from the attached nylon cord in a shaded area to extend the life of the exquisite, hand painted detail. Easily fill this feeder with nectar through the generous 2" opening and replace the plastic cap. Because each feeder is handmade, there may be slight differences in the amount of nectar the feeder will hold. 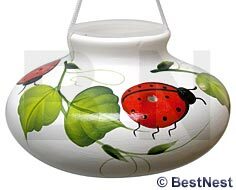 Provide the hummingbirds in your yard with the energy they need using this Ladybug Ceramic Hummingbird Feeder. Made in the USA. CareFree Hummingbird and Oriole Feeder Cleaner, 16 oz. Best-1 Instant Hummingbird Nectar, Clear, 14 oz. Aspects HummZinger Excel Hummingbird Feeder, 16 oz. Lone Wolf Ceramic Hummingbird Feeder, Garnet Posy, 10 oz. Lone Wolf Ceramic Hummingbird Feeder, Red Posy, 10 oz. Lone Wolf Ceramic Hummingbird Feeder, Red Kona, 10 oz.